At the end of the day on Thursday, I was sitting in the back of a large bus heading to Antalya, which was my first stop. Seated next to me was a Turkish woman with a small baby about 8 months old (who I was drooling over, of course). At the first rest stop, she indicated that she had to run in and proceeded to hand the baby over to me. I had no problem watching him – he was adorable with huge dark brown eyes and a little bowl-shaped haircut – but it kind of threw me that she would entrust her child to a total stranger. Again, it was such a cultural difference. At any rate, we finally reached Antalya about 6 am. This was the crucial moment in my decision-making. 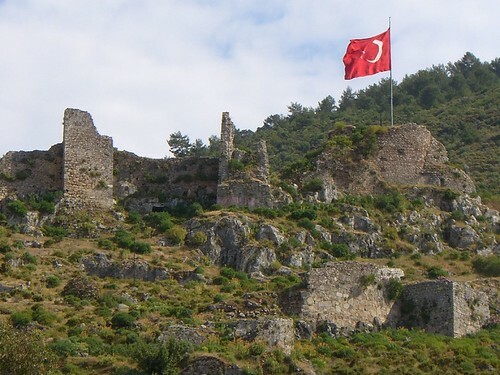 I had been trying to decide whether to go to the Olympus/Cirali area and stay there a day or two before heading for Fethiye. However, in the end I decided that I didn’t want to be schlepping my luggage more than I had to, so I went ahead and got a ticket to Fethiye (as did the two Korean girls I was riding with) and planned to stay there 3 nights. We found a company selling tickets on a bus that was leaving at 7 am, so we headed back with the driver to put our luggage aboard. We should have realized right away that this was not the typical luxury bus we had been on – the windshield had several cracks and newspaper lined the aisles. However, we gamely got on and sat down and were soon on our way. The bus was fairly empty at first but as it wound its way through the scenic mountains and valleys, it made periodic stops at small villages. This was obviously not an express bus. The local villagers continued to pile on bringing an array of assorted belongings with them. One man had 2 huge bags of oranges that must have weighed 50 lbs. each. At any minute, I expected to see someone get on with livestock. The empty seat next to me was soon taken by a shriveled old woman wearing the typical cotton scarf, sweater, cardigan and Turkish pants. 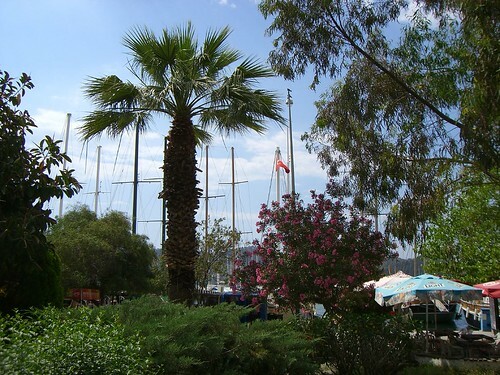 She told me (via pointing to her teeth) that she was going to the dentist in Fethiye, a distance of some 80 km. away. She grinned at my feeble attempts to speak Turkish and then started rooting around in her purse, a large beat-up red leather bag stamped “Gucci.” Eventually, she pulled out a plastic bag containing a mixture of unknown nuts and golden raisins. She forced open my hand and dumped a pile into it, indicating that I was to eat them. Ignoring the thoughts of wanton bacteria running amuck, I gamely ate the mixture, which was actually pretty good. We were pals after that and she would occasionally chatter away to me, notwithstanding the fact that I had no idea what she was saying. I just smiled away, which seemed to be enough of a response for her. Although the local bus was a far cry from the comfortable express I was used to, I wouldn’t have missed this trip for the world. I saw scenes that were priceless – at one stop, a woman pulled a wooden cart laden high with huge bundles tied in cloth. She was followed by a flock of sheep and then a herd of goats. A man, presumably her husband, brought up the rear. The scenery was as incredible as the picturesque villages – mountains, some snow-capped, loomed all around together with pine trees and the occasional green valleys. Soon, the bus began letting off people so I assumed we were nearing Fethiye. Around 10:30 am, we got off at the small otogar on the outskirts of town, which meant I had 2 things to accomplish. Find a hotel. Figure out how to get there. They both turned out easier than I thought. My Korean pals went off to a hostel someplace and I tried to find a phone to call one of the places listed in Lonely Planet. The shopkeeper who sells phonecards happened to be out of them, so he indicated that I could just use his phone. I called and made a reservation with the Villa Daffodil, then grabbed a taxi. It was worth the 7 lira not to have to deal with finding the correct dolmus to take into town. The taxi drove down a street right along the harbor and let me off at the hotel. 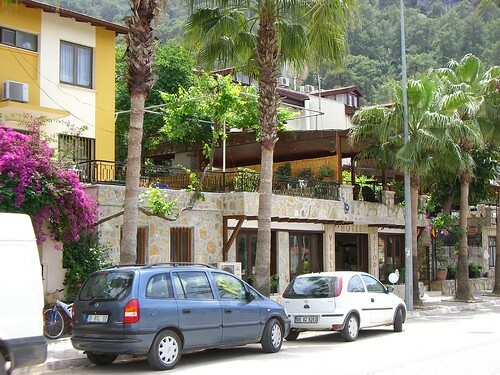 This place is beautiful – the hotel terrace directly overlooks the bay and mountains. Palm trees line the street, interspersed with lush colorful bougainvillea and azaleas. I checked in and decided to take a shower, then head into town. It’s a lovely walk from the hotel to town but the town also has a dolmus that does nothing but go back and forth along the harbor. It’s nice to have the option of riding, especially for only 1 lira. I pretty much took it easy the rest of the day – I wandered around town and stopped at the ruins from ancient Roman times. Unfortunately, it’s not in very good shape and is further marred by the occasional graffiti. After a quick late lunch next to the water, I walked along the harbor and looked at all the beautiful yachts and boats scattered throughout the bay. The town is rather largish but has a wonderful relaxed atmosphere. Everyone is in low gear here and no one rushes to do anything. The lack of sleep soon got to me and I made my way back to the hotel. However, I noticed some people up on the terrace talking and drinking, so I decided to have a glass of wine before going to bed. By this time, the sun had set and I sat and peacefully sipped my wine while gazing out onto the flickering lights and dark waters below. Onward to bed – tomorrow, the beach! This entry was posted on May 12, 2007 at 12:24 pm	and is filed under Fethiye, Turkey, Turquoise Riviera, Villa Daffodil. You can follow any responses to this entry through the RSS 2.0 feed. You can leave a response, or trackback from your own site. Enjoying your traveloge; keep the descriptions coming and have fun. Great entries Mardee!! You give very vivid descriptions. It sounds like you’re having a wonderful time. I feel like I am right there with you, walking the streets and climbing the hills into some magnificent vista. The human stories are priceless. Thanks so much for sharing all of this in such an enjoyable way. Wouldn’t miss a day of it!